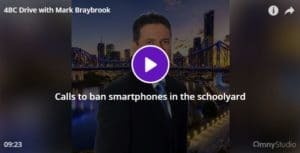 France has banned smartphones in all primary schools and now there are calls for schools here to follow suit. Educational experts say allowing young children phones can make them distracted, socially isolated and even leave them open to bullying. Darren Stevenson from Extend Before and After School Care tells Mark he can not see any reason why a primary school child would need a smartphone at school.